Codemasters brings Taito's classic arcade title up to date with Bubble Bobble Revolution on the Nintendo DS. Bubble Bobble Revolution takes many of the same play-mechanics from the original game and adds some new abilities such as power-bubbles and additional enemies to make for a solidly entertaining update. The game also includes a complete emulated version of the original game with makes for some exciting play. There are also additional mini-games, co-operative play and enhanced gameplay add even more excitement to the package. Read on and find out why classic game fans should love Bubble Bobble Revolution. Bubble Bobble Revolution upgrades the visuals, soundtrack and animation but doesn't stray too far from the original game. The simplicity and sheer fun of Bubble Bobble has remained appealing through nearly two decades and this cool update doesn't change the formula too much. Codemasters have updated the graphics, added a few new weapons and enemy types, but the basic game is immediately familiar. Like the previous games, the objective remains to shoot bubbles at enemies to capture them, then run over them and collect fruits. As in the original game, players also need to avoid the enemies' fire and attacks, and have to navigate a variety of levels consisting of platforms and boards. The newly enhanced DS version stays true to the original game, except the action now takes place across both screens and the boards are a little wider than the screen can display. The levels scroll very quickly, and the action can move from the bottom to the top very quickly, which means you'll have to pay attention throughout. While it's a bit hard to get used to these screen shifts, once you adjust to this, it makes the game feel bigger than the original. This approach obviously leads to larger and more expansive levels, but the drawback here is that it makes it more difficult to see where some of the enemies are. This is frustrating initially, but once you learn to anticipate where they are, it becomes easier. You can also figure out where they are by looking to see if any bullets are heading at you from off the screen. These new boards are slightly more challenging than in the original game, and make you work a bit harder to find all the enemies and escape without harm. At first some players will likely be confused by some of these layouts, but they have new abilities, such as blowing a super-bubble that allows them to jump higher and reach otherwise unreachable areas. 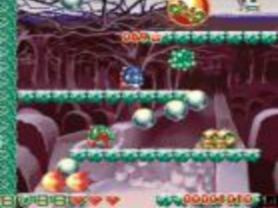 Players will encounter some of the classic bubble power-ups including the famous zapping one which takes them through the levels along with several new types of bubbles. You now have the option of using lightning and ghost types of bubbles, which brings several new play mechanics to the game. Fortunately, these additions only enhance the gameplay. These make things more interesting, with some unleashing instant attacks on their foes which adds more strategy to Bubble Bobble's gameplay. The game's save system is also fairly nice, and allows you to continue from the same levels you just completed without having to replay the same levels again and again. Bubble Bobble Revolution's smooth controls are fairly standard for the DS, and most of the time, the action is easy to control. Every element of Bubble Bobble Revolution succeeds in bringing back the feel and style of the original game. The 2D approach works well on the DS screen, with nicely designed sprites and a coherent look that mixes nostalgia with more modern graphics to create a game that's been faithfully updated for the DS. While some of the levels in the game can seem to be initially frustrating and overly complex, a little bit of trial and error should get you through some of these rough spots. Players who are familiar with the earlier games will be happy to know that the basic mechanics and gameplay remain intact. Each addition and upgrade of the classic game seems to be smartly designed and balances both the original's look with more current sensibilities to create an excellent update. Bubble Bobble Revolution isn't quite as revolutionary as you'd expect it to be, but this is still an excellent example of how to update a classic game without losing the essence of its appeal. Update: We've heard many reports that this game is being recalled by Codemasters due to some serious glitches. This apparently only applies to the North American version. We'll keep you posted.